The Reduce Student Costs Task Force has released Reducing Student Costs: A Report on Textbooks and Course Materials. Appointed by the PSU Faculty Senate, the Associated Students of PSU, and the Provost, the Task Force led by Library Dean Marilyn Moody was charged with making recommendations for lowering the cost of course materials for PSU students. The Task Force recommends that PSU pursue a “full environmental scan” of students and faculty in a range of disciplines to address the complexities of the challenge. The Task Force encourages collaboration among PSU Library, the Office of Academic Innovation, PSU students, PSU faculty, the state Higher Education Coordinating Commission, local businesses, and more. They recommend that stakeholders support faculty in using open educational resources and pursuing further development of open textbooks. The Task Force would like to see an investment of time, money, and infrastructure allocated to the development of open education resources (OERs) at Portland State. The Task Force suggests an examination of other approaches, including the adoption of open textbooks by multiple sections of individual classes and further investments in the Library for textbook and course material acquisitions as well as to assist faculty in identifying appropriate OERs. The reported was authored by Task Force members Marilyn K. Moody (chair), Shadi Alkhaledi, Chelsey Weinmann, Kathleen M. Steppe, Jill Emery, Kimberly D. Pendell, Joel Bettridge, Karen Bjork, Emily Ford, Vincent Schreck, Berrin Erdogan, Gerardo Lafferriere, and Ralf Widenhorn. Many thanks to Stephanie Doig, PSU Library, for her contributions. 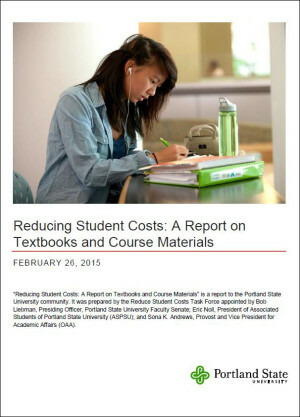 The Task Force report, Reducing Student Costs: A Report on Textbooks and Course Materials, is available online in PDXScholar.